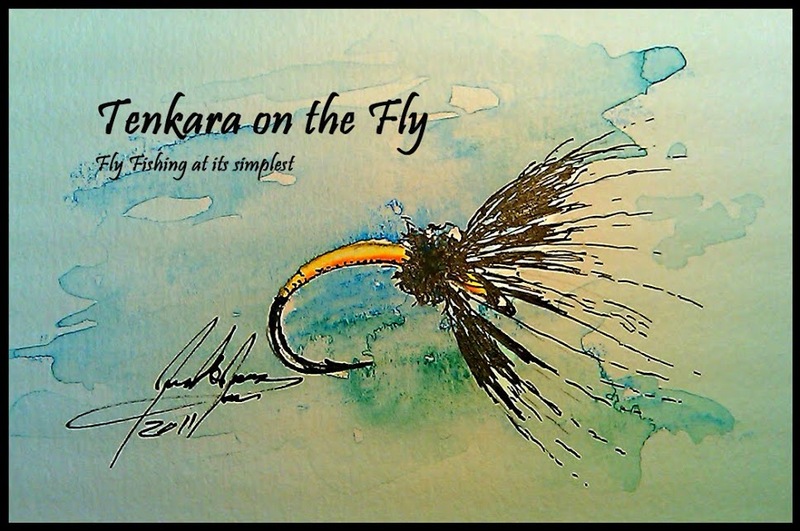 Two more Tenkara fly swaps closed recently and I received two boxes of new flies of some talented tyers! I will make sure to put those flies to good use over the next few outings, the trout are hungry and willing (well, most of the time). Today I was able to sneak out for a few hours before an early Easter Sunday Dinner with friends. Since I didn't want to venture too far, I thought I would pay another visit to Bear Creek and see how far Spring came along since the last time. We have had some rain overnight but the flows looked good, they haven't spiked. The plan for today was to test some hand furled hi-vis line in different weights and to practice different presentation techniques as described in the most recent Tenkara USA video, including giving it a serious try fishing subsurface without an indicator (this is a big leap of faith for me). You wouldn't think it's Spring here on the Front Range, it was a "balmy" 38F when I got to the river around 10am and it didn't warm up to more than 42F by when I left around 2.30pm. It actually even snowed for maybe half an hour while I was fishing. It was a BWO day with, unfortunately, no BWO activity on the water. The fishing started out very good, fish hitting both my mercury RS2 and Tenkarabum's Killer Kebari. Strikes where easily detectable with the new hi-vis line I made this week, it also cast very nicely, comparable with the T-USA furled line but more visible. I might try to make a wee bit heaver though to improve turnover. After having lost a good number of those two flies to trees and snags, I decided to fish with only a Bubble Kebari of Kiwi from the North River blog. At first, I fished it on a dead drift and swing with not much success. In one pool the cast didn't quite go as planned and I retrieved the fly upstream to recast when a fish hit it. I tried it again and another fish hit. Turns out that the fish preferred this fly today twitched upstream. It literally drove them nuts, I had at times 2 or 3 fish chasing it but they missed the fly a lot because of the erratic movement. It was good fun though to observe the fish trying to get the fly. I headed home early to make it on time for Easter Dinner, with just under two dozen trout caught. It was a cold, but good day. Weather: gray, low clouds, 38-42F, NO WIND!